Pink is one of the rarest colours in the fancy colour diamond world. 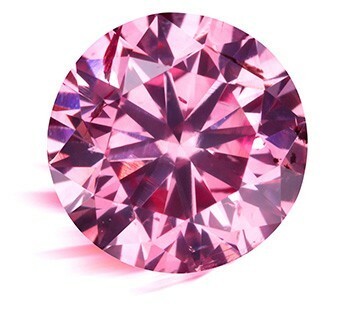 Unlike yellow diamonds, which comprise over 60% of all fancy colour diamonds produced, natural pinks fall into the same category as blues and reds for their extreme rarity. Because of their striking colour and constraints on supply (the Argyle mine, which currently produces 90% of the world’s pinks, is scheduled to shut down by 2021), pink diamonds represent excellent investment opportunities. The price of pink diamonds has been steadily climbing; this graph highlights the growth in prices across several categories of investment grade pink diamonds since 2005. When considering a rare pink diamond as an investment, we opt for stones with brighter colour saturation and as large a size as fits your budget. The range of colour in pink diamonds is quite broad, ranging from a subtle hint of rose, to the rich color of a raspberry. The GIA color grades for pink diamonds begin at Faint and, as their saturation increases, run through Very Light, Light, Fancy Light, Fancy, and Fancy Intense, to Fancy Vivid. Diamonds that are darker in tone may receive grades of Fancy Dark (weaker in saturation), or Fancy Deep (stronger in saturation). 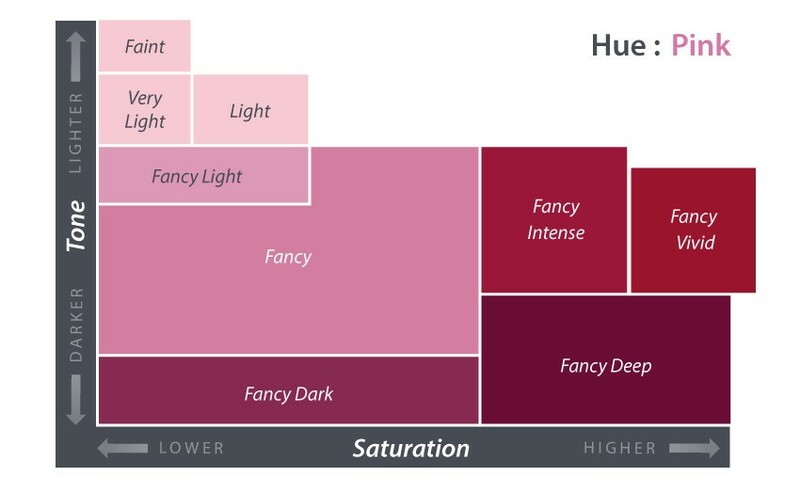 If a diamond in this hue range is both very dark in tone and very strong in saturation it may receive a grade of Fancy Red. There are three important factors to understanding the colour of pink diamonds and differences in value between individual stones: hue, saturation, & tone. Hue is the dominant colour of the diamond, taking into consideration any overtone or secondary modifying colours; saturation is the strength of hue; and tone is the amount of light or darkness in the diamond. The more intense the colour, the more rare and more valuable the diamond. In the case of pinks, diamonds come in a variety of ‘straight’ pink shades, as well as shades with secondary modifying colours such as orange, brown, purple and yellow. For investment purposes, Australian Diamond Portfolio recommends only purchasing straight pink diamonds with no secondary overtone, and purplish pink diamonds with a purple modifier. Fancy Pink diamonds are assessed according to intensity of colour, or a combination of saturation and tone. The following chart describe pink diamond intensities; the further along this spectrum you go, the richer and more intense the pink is to be seen in the diamond. The brighter & more intense a stone’s colour saturation, the more it will be worth. 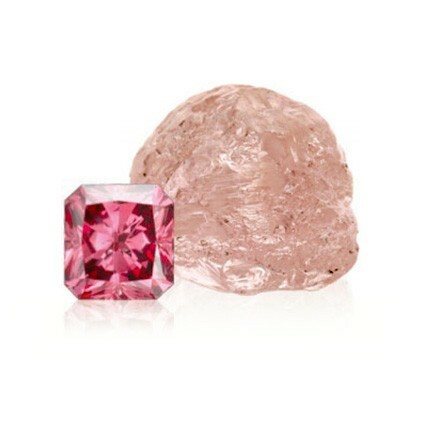 For example, a Fancy Intense Pink diamond will be worth more than a Fancy Pink. Generally speaking, Fancy Vivid Pinks are the most valuable, having both the greatest saturation combined with the brightest tone. Pink diamonds have been sourced in very limited supply from mines around the world. In the 17th and 18th centuries, rich discoveries of pinks were made in the Golconda region in India and the Minas Gerais region in Brazil. Since the late 1980s, over 90% of the world’s fancy pink diamond supply has come from Rio Tinto’s Argyle mine in Western Australia.